The clock is ticking and time is running out to secure some sword presents for Christmas 2018.. Now with each day that passes, the chances of a lost, bungled or delayed shipment start to go up exponentially.. Indeed, if I could boil the SBG Christmas Sword Buying Guide down to a single most important sentence it would be ‘get your Christmas shopping done as early as possible’ – and at the store it is so important that it is policy..
Order before the 10th to get the order in for Christmas. Order after the 10th and while we will do our best, shipping delays and other factors out of our control mean that we will be discouraging last minute orders or rush shipments. Not good for you and not good to receive a sword in unbattered condition.. Furthermore, we are going on holidays too – a fairly long one this time, from the 22nd of December to the 7th of January. So as much as we would like to, we wont be able to help with last minute disasters caused by orders placed after the 10th..
Orders will still be able to be placed during our vacation period, however emails will not be answered and no shipping will occur until we are back on the 7th. There will likely be a few last minute specials and offers, though many of the best deals have come and gone in the sales that followed thanksgiving. However don’t bet the farm on a special coming along – functional swords have very low profits and its very hard to discount any further than we do on a daily basis, so while some new offers may well come up – don’t hold out. The time to get Christmas sword shopping taken care of is NOW..
We weren’t going to join in the whole Black Friday/Cyber Monday sales hype thingy – and I am sure our newsletter subscribers are getting hit by all kinds of offers in their inbox. Sword related ones are currently being discussed on the SBG forum here.. But here’s one more to the mix, requested by Ryujin to help move some excess stock of O-Katana T10 blades.. And so for today only, they go from the most expensive T10 Ryujin blade to the most affordable, from $269 to $179..
Just today, and that’s it – at midnight EST it will turn into a pumpkin – so if you want a genuine good deal, here one of the best..
Our friends at Ryujin have done it again, with the release of two SBG exclusive swords seen previously that have had a couple of nice upgrades.. 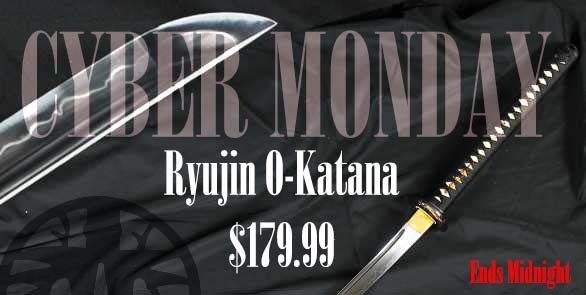 The first is a bargain hunters delight – the $199.99 Musashi/Bamboo Custom Katana. This design amalgamates previous designs based on either the classic Musashi tsuba or the Bamboo tsuba into one great value for money product and the most affordable way to pick up one of their famous T10 tool steel blades..
And for those of you who prefer a mid range sword (that kind of looks like it might be high end) – we present the upgraded version of the Mother of Pearl Saya Ryujin Katana. This design takes the elite Choji Hamon blade, compliments it with the most attractive fitting combination there is, and blings it up with a beatutiful saya with genuine mother of pearl inserts..
And the best part, its cheaper than the normal version of this elite sword! 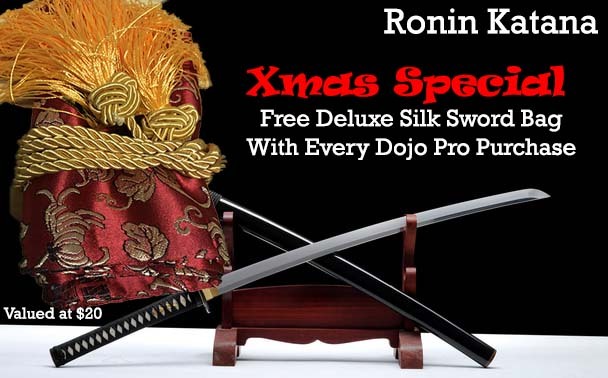 So whether you are in the market for a budget piece or something close to high end without the high end price tag, Ryujin has you covered..
Well, not the type of Christmas bonus where you get a nice chunk of cash, but its the next best thing..
From now until just before Christmas we have a couple of freebies to offer to everyone who orders. First off, we bought a large supply of assorted silk sword bags worth $20 and will be adding them to each and every Dojo Pro Katana order purchased over the holiday season. They come in various style and colors, but as it is a free gift (and not one of those ‘free gifts’ where the price gets bumped up to cover it..) there can be no exchanges, but we will send you a nice one.. 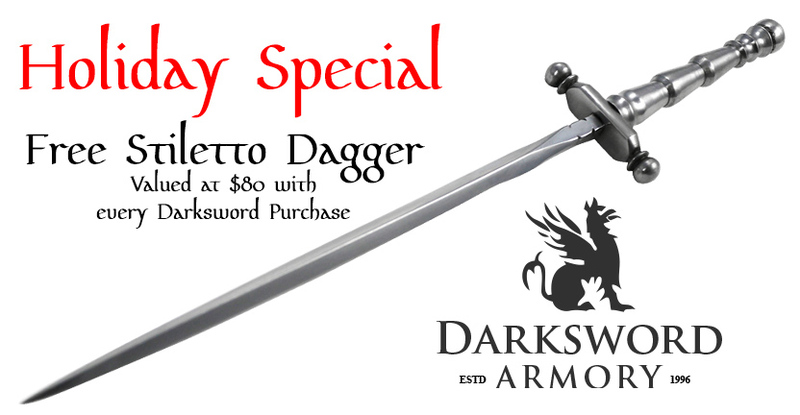 The second offer is for any Darksword Armory sword purchased from now until the end of the holiday season. In addition to free shipping and free sharpening you will also get a free highly quality Stiletto dagger valued at $80 – absolutely free. All the more reason to use the SBG Sword Store for your Christmas shopping this year..!